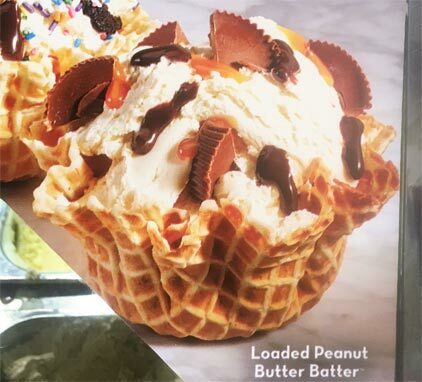 [By Nick, New for 2016] I've been hearing news about some new cookie batter flavors at Cold Stone. I wasn't too excited about it all since the two flavors I heard about weren't all that creative. However, I just so happened to find myself at Cold Stone so I was debating on trying one of them. That was until I saw a sign for this little gem that wasn't in their original promotion. That just sounds so amazing and guess what, it was! The ice cream on its own is perfect. It delivers on its promise. I'm quite the raw cookie dough enthusiast and this ice cream has the texture down. It's smooth like your typical Cold Stone flavor but there's a little bit of cookie dough grit to it that's so remarkable. The flavor of the ice cream reminds me a lot of Reese's Puffs cereal. I was having flash backs to my childhood of eating bowl after bowl of that cereal. It's peanut buttery but not overwhelmingly so. If peanut butter milk was a thing, which it should be, this ice cream would be that flavor. The Reese's cups add a stronger peanut butter vibe to the mix with the fudge adding the much needed chocolate component. The caramel was a no show but the other flavors were strong enough on their own that it wouldn't have been necessary. Heck, I didn't even know there was caramel in it until I read the description. 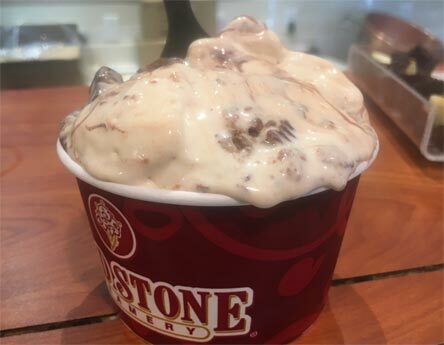 Still, this ice cream is why Cold Stone will always have its place in the ice cream world. They're able to do things other companies can't and they make sure to capitalize on that. While some ice creams have been a bust for them, this one is definitely a winner. Nick, It looks like your ice cream was suffering the crazy heat wave ;) Glad to see you posting, I know you've been busy!